For internet users in emerging and developing nations, social relationships are a fundamental aspect of their interaction with the virtual world. Majorities in most nations use the internet every day, and they use their time online to stay in touch with friends and family and access social networks, sharing views about music, movies and sports freely with their friends and acquaintances. Overall, internet users also like to get information about politics and health care and to a lesser extent access government services online. Career and commerce activities are even less common, with fewer people looking and applying for jobs, making or receiving payments, buying products and taking online classes. However, there is much variation for these activities across the nations surveyed. Half or more of internet users in 27 of 32 emerging and developing nations say they use the internet daily. The most avid internet consumers are found in Chile and Lebanon, where 83% of internet users say they use it once a day or more. And three-quarters or more of users in Poland, Jordan, Tunisia, Argentina and Brazil use the internet in their daily lives. Meanwhile, only about a third of internet users in Nicaragua (32%) and Uganda (32%) access the internet every day. And 37% of Filipino and 38% of Senegalese internet users say the same. As with other aspects of internet use, younger users are much more likely to say they access the internet daily, compared with older people. For example, 95% of internet users in Lebanon under 35 years of age say they access the internet daily, while only 67% of those over 34 years say the same. In all, there is a significant age gap on daily internet use in 19 of the countries surveyed. When asked about various online activities, internet users in emerging and developing nations are clear that one activity in particular, staying in touch with friends and family, is the most popular. Overall, a median of 86% across the nations surveyed say they have contacted close relations via the internet in the past year. In fact, across the eight activities tested, staying in touch with friends and family is the predominant choice in every country surveyed (excluding Pakistan, which had insufficient sample size for internet activity analysis). Of those online, 100% of Senegalese, 93% of Ukrainians and 92% of Chileans socialize with family and friends online. Indian internet users are the least likely to say they do this, though still 63% of the online population use the internet to socialize. Getting various types of information, such as political news, health information and government services, is the next tier of internet use. A median of 54% among internet users in emerging and developing nations say they get political news online. Fully eight-in-ten Ukrainian and Vietnamese internet users say they get information about politics online. And 72% of internet users in Tunisia, 70% in Lebanon and 68% in Egypt say they get political information from the Web. Six-in-ten or more of online people in Russia (68%), Poland (66%), Kenya (62%) and China (62%) get political information online. Getting information about health and medicine for individuals and their families is done by a median of 46% of internet users across the countries surveyed. More than six-in-ten among internet users in Ukraine (64%), Poland (64%) and Russia (63%) say they have gotten health information online in the past 12 months. Female internet users in Poland (72%), Russia (68%) and Ukraine (68%) are more likely than male users (56%, 56% and 59% respectively) to access this online medical data. In Latin America, about six-in-ten or more of internet users in Venezuela, Peru, Nicaragua and Chile say they get medical information online. A median of about four-in-ten internet users (42%) in emerging and developing nations use the internet to get information about government or public services. This includes half or more of internet users in Tunisia, Russia, Tanzania, Senegal, Nigeria and Ukraine. Participation in commerce and career advancement is in the bottom tier of internet activities within emerging and developing nations. In this category, looking or applying for a job is the most common activity, representing a median of 35% among internet users across the countries surveyed. More than half of internet users in Bangladesh (62%), India (55%) and Kenya (53%) say they have looked or applied for a job online in the past 12 months, but only 18% in Lebanon say the same. A median of only 22% conduct financial transactions online, but there is great variation on this activity. For instance, two-thirds of internet users in Poland make or receive payments online. And in one of the largest global financial markets, China, 44% of internet users say they use online banking in some form. Online payments are also more common among adult internet users in Tanzania, Chile, Russia and Kenya (where many make or receive payments with their cell phones). As is the case with online banking, few internet users in emerging and developing nations (a median of 16%) say they have bought a product online in the last year. However, the activity is much more common in China, one of the largest online global shopping markets. About half (52%) of online Chinese say they have a bought a product in the last 12 months. This is the highest percentage in this category among the countries surveyed besides Poland (58%). The least common activity online among the eight tested is taking an online class or course that leads to a certificate. A median of only 13% among internet users in emerging and developing nations say they have taken a class in the past year. Across most of these online activities there is little variation by gender among internet users in emerging nations. However, when it comes to getting news and information about politics, many male internet users are more avid online news readers than females. For instance, 65% of online Nigerian men get political news from the internet, while only 40% of Nigerian women do the same. Similar numbers of online adults ages 18 to 34 and 35 and older, with few exceptions, use the internet to get health information, news about politics, or information on public services; buy products; do online banking; or take online classes. However, there are larger differences when it comes to staying in touch with friends and family and looking or applying for jobs. In 19 countries, internet users ages 18 to 34 use the internet to stay in touch with close friends or relatives more frequently than those 35 and older. And adults under the age of 35 use the internet to look for job opportunities more frequently than their older counterparts in 20 emerging and developing countries. Socializing among internet users also applies to accessing social networks, and this is a very popular activity. 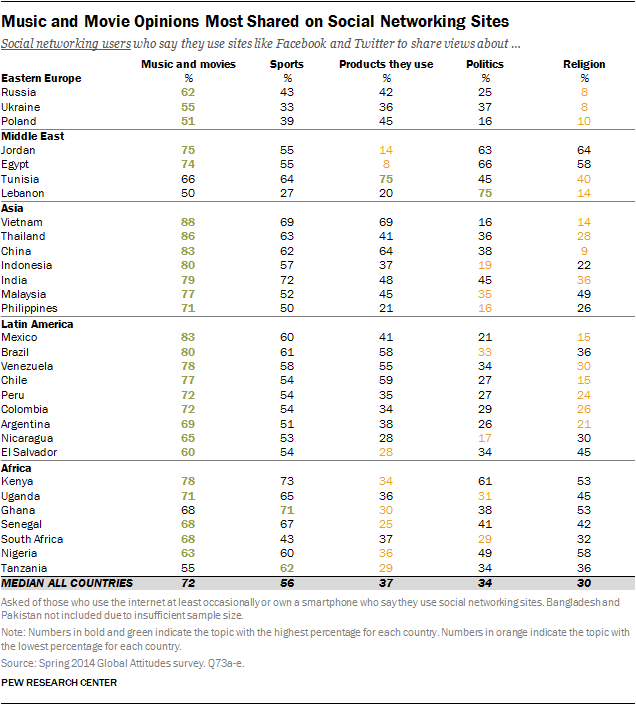 Among internet users in the emerging and developing countries surveyed, a median of 82% use their internet connections to access social networking sites, such as Facebook, Twitter and other country-specific platforms. Majorities of internet users in all the countries surveyed with sufficient sample size to analyze say that they use social networking. The highest percentage can be found in the Philippines, where 93% of online adults use social networking sites. But high levels of use are found in all the countries surveyed, including 88% of internet users in Kenya and Venezuela, as well as 87% in Chile, Senegal and Tunisia. The only countries surveyed where less than two-thirds of online adults use social networking sites are India, where 65% of internet users say they use social networks, Poland (62%) and China (58%). As with overall internet access, social networking is more popular among young people than among those ages 35 and older. In the most extreme example, 85% of Poles ages 18-34 who have internet access say they use social networks. Only 44% of older Poles say the same, an age gap of 41 percentage points. Large and significant age gaps on social media usage appear in 22 of the countries surveyed. Among social networkers in emerging and developing nations, the most common online activity, besides staying in touch with friends and family, is sharing views about music and movies. But majorities also use social networks to talk about sports. Less discussed topics include the products people use, politics and religion. Overall, a median of 72% of social networkers in emerging and developing nations say they use these platforms to share views about music and movies. In fact, among the items tested, this is the top use of social media in 26 of the countries surveyed. Talking about music and movies is especially popular among social networkers in Vietnam (88%), Thailand (86%), China (83%) and Mexico (83%). But half or more of social networkers in every country surveyed say they participate in sharing views about music and movies. Sharing views about sports is also popular. A median of 56% of social networkers say they have talked about sports on social media sites. Talking about sports is popular in Africa and Asia, including 73% of social networking users in Kenya and 71% in Ghana. And 72% of Indian social networking users are keen on sharing views about this topic. Of less interest among social networkers in emerging and developing nations is sharing views about the products they use, politics and religion. But there are some notable exceptions. For example, while only a median of 37% say they share information about products they use on social networks, 75% do so in Tunisia, while 69% in Vietnam and 64% in China do. When it comes to politics, Middle Easterners share information with their friends and family with greater frequency. In Lebanon, three-quarters of social networking users say they share information about politics on these platforms. And 66% of Egyptians and 63% of Jordanian social networkers agree. Religion is the least shared topic. But 64% of social networking users in Jordan and 58% each in Nigeria and Egypt say they share their views about religion online. Male social networkers are much more likely to say they use the sites to share views about sports compared with their female counterparts. For example, in Tunisia, 82% of male social networkers say they talk about sports but only 31% of females do. And overall, men who use social networks share views about sports more often than women users in 25 countries. And while there are age differences in some of these countries among the social networking activities tested, they are particularly pronounced in sharing views about music and movies. In 16 countries with sufficient sample sizes to analyze, 18- to 34-year-olds are more likely to say they use social networks to share views about music and movies than those 35 and older.